ProMRO software is designed for the MRO (maintenance, repair and overhaul), with a focus on the maintenance of aviation and equipment. 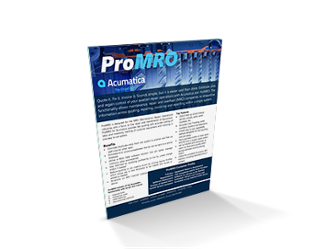 ProMRO is embedded within Acumatica Cloud ERP and provides fast quoting, costing of labor and materials, tracking of customer equipment, serial numbers, invoicing (AR) and payables in one easy to use system. Acumatica was recently ranked as one of the easiest ERP systems available. With NO PER USER license cost, Acumatica enables even smaller businesses to have the best ERP and repair functionality within reach of all your system users. If your company requires FAA compliance tools, the please see our ProFBO solution. NO per user license fee if more than 5 to 10 users are needed, SMB Edition starts with 5 users and can increase to 10. Advanced Edition allows for unlimited users with no per user license fee. Utilize the complete Acumatica ERP solution including Manufacturing if needed. ProMRO enhances core Acumatica functionality within Projects, Inventory and CRM. Service Profiles take the guess work out of standard services and/or repairs. Create easy to use, repeatable, defined templates that include standardizing material, labor, expenses needed for repairs, overhaul, etc. Easily tailored to meet client’s needs. Create equipment specific or manufacturer model Service Profiles to ensure consistency. Easily and automatically create core fee lines on sales orders and RMA’s for core return items. Track expected core returns with reports on your dashboard and/or reporting. Intuitive product search mechanism in which items can be grouped into categories that sales or purchasing can follow right down the tree structure ensuring selection of the appropriate product for the category and increasing upselling opportunities by showing items as a group rather than stand alone. Make finding items for estimates, sales orders, and/or purchase orders seamless by utilizing a tree style approach. Allows you to leverage the power of an inventory search mechanism that allows you to find the parts that you need quickly and readily. Place purchase orders or issue stock directly from a project. Ability to track Customer Equipment and any estimates and work done on the specific equipment. Optional – CRM for sales and marketing is an optional module. Work with prospects and customers to create an estimate using Service Profiles or Quick Item Search functionality right from the Opportunities page. 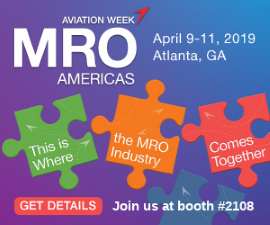 View revenue and cost budgets to make changes on the fly to ensure profitability and margins. When the estimate is won convert to a project using standard Acumatica Project functionality. All information, items, services, and notes entered on the original estimate are retained and transferred over to the project. This great feature from Project is also available when using Opportunities so you can review budgets and make changes on the fly. Additional out of scope work can be easily estimated and then added to the original project already in progress by utilizing the Adder functionality. If you would like to see Acumatica and ProMRO in action or if you just want to learn more about the product, just call us at 800-331-8382 or email us at info@clientsfirst-tx.com. If you are an Acumatica Partner, please reach out to us at info@cfbs-us.com or call 800.331.8382. Clients First offers Partner programs for our ProFBO and ProMRO products.